"Running was the easy part. Lorraine Moller won the first marathon she ran - a race she hadn't even intended to finish - and the next eight as well. 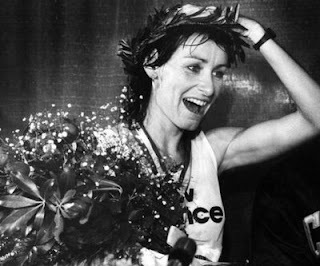 The brilliant runner from New Zealand was both pioneer and champion, winning three world championships (1980, '82, and '84) and three Osaka Marathons (1986, '87, and '90). The only runner to race in each of the first four women's Olympic marathons, Moller claimed the bronze medal at the Barcelona Games in 1992 at the age of 37. She won the Boston Marathon in 1984, and she's back to celebrate the 25th anniversary of that victory." Please go here to read the full story.